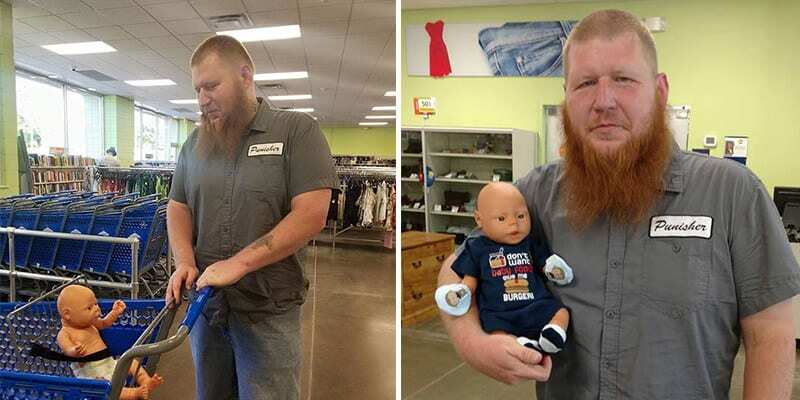 Shoppers and store assistants were shocked when this big burly man, with tattoos, was spotted browsing the doll’s clothing section of a store. He was totally not what anyone was expecting to see in that section of the store, and thankfully one store employee plucked up the courage to talk to the seemingly intimidating man. They say you shouldn’t judge a book by its cover and there were probably a few people in this store doing just that when they spotted him. It can be easy to judge someone even though you don’t know a thing about them, rightly or wrongly, it is human nature to make quick decisions about a person. While we can make a judgment, many of us are aware that we don’t truly know a person without getting to know them so will not hold what someone looks like against them in favor of learning a bit about them. We aren’t likely to approach a seemingly intimidating man at the best of times, but when he is shopping for doll’s clothes, we might just think he is a bit ‘out there’ and try to avoid him at all costs. What this store assistant found out about this tattooed man will melt your heart. His trip to the store to buy doll’s clothing is adorable once you discover the reason why. Keenan Watkins strolled into a Goodwill store, and many people would have assumed he was probably going to get some new jeans or some kind of heavy-duty workwear. Instead, he went straight past all of those sections and headed for the doll’s clothing area. He wasn’t looking for anything else other than doll’s clothes, which eventually meant that people began to look at him with curiosity. Although he might have appeared intimidating, a store employee, Sadie Collins, approached the man to see if she could find out a little bit of information. Watkins had the word “Punisher” sewn on to his shirt so you wouldn’t blame the store assistant for being slightly nervous on her approach. 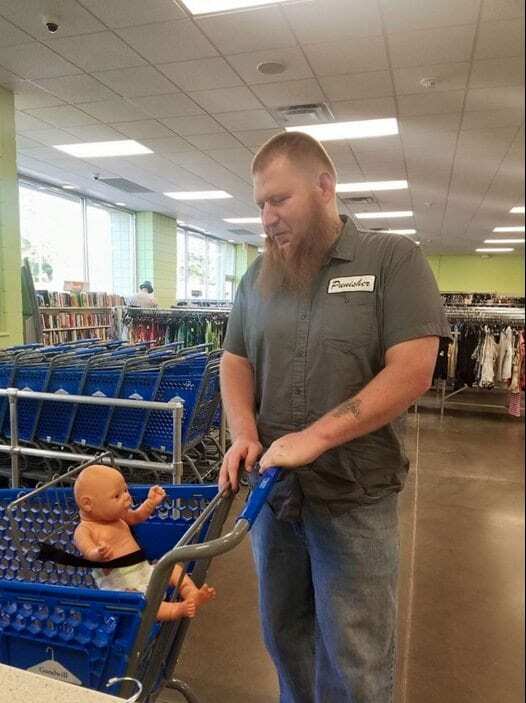 Although it might not have been obvious from farther away, Watkins had brought along a tiny little friend to help him shop. 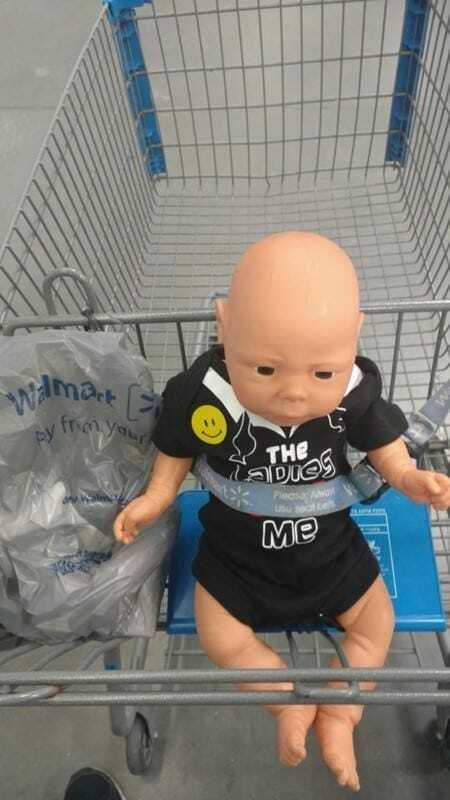 In his cart was a little doll, named Davey, who was going to be the lucky owner of some new threads once Watkins had picked some out for him. 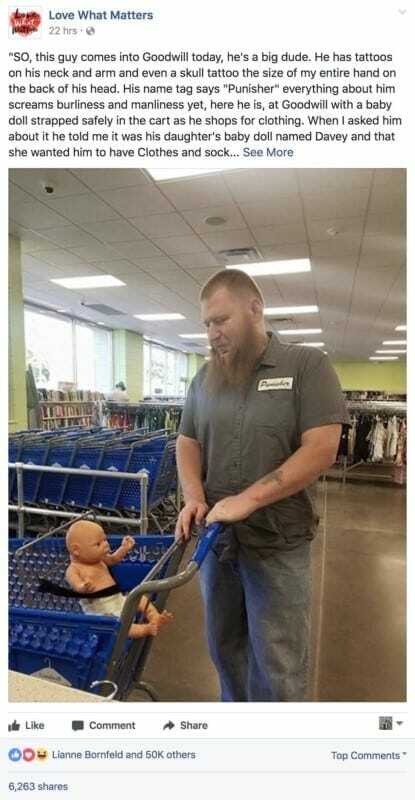 Davey arrived at the store without any clothes, just wearing a diaper, but soon he would find warmth in the outfit his large tattooed carer would buy for him. 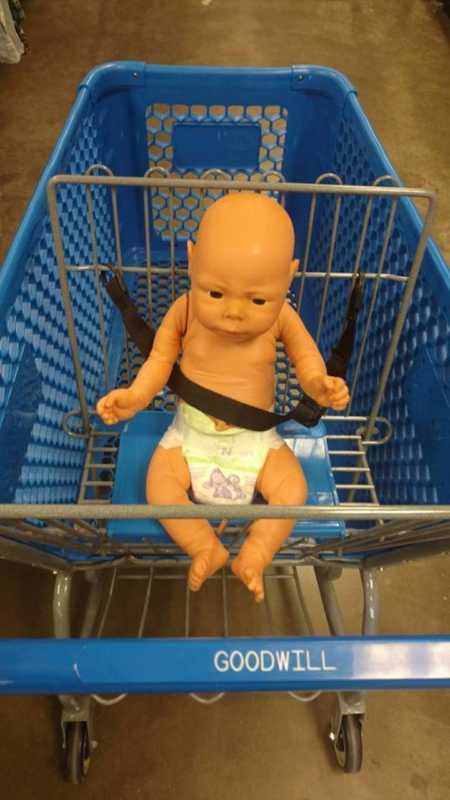 Once Davey was safely strapped into the cart, the pair could start their adventure through the store together with the hopes of covering up the baby doll’s bare torso and limbs. Davey was desperately in need of some new threads. He needed clothes, for sure, but he also needed to find some socks, to make sure his little toes wouldn’t fall off from being too chilly! Luckily Watkins brought the doll to the right place, and soon he was able to browse through a bunch of outfits to kit his little companion out in. Quite content to chill out in the cart while being wheeled around, this day was all about Davey. 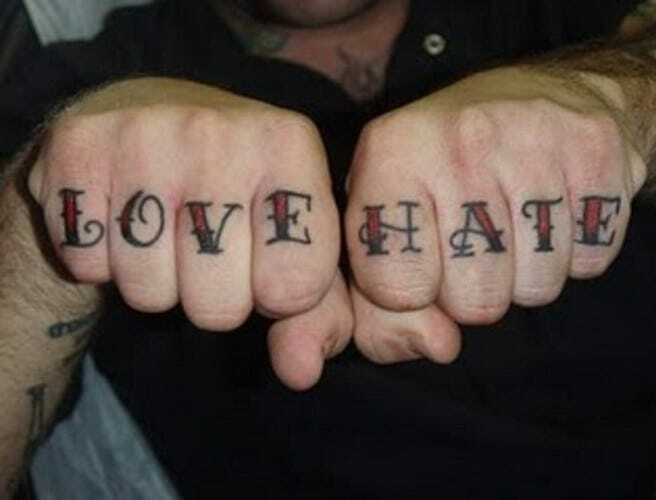 Watkins has some tattoos that would normally scare plenty of people away. The store assistant didn’t get put off by the tattoos on his neck or arm. The large skull that was inked onto the back of his head was not enough to discourage her to approach the man, even though it was the size of her entire hand. 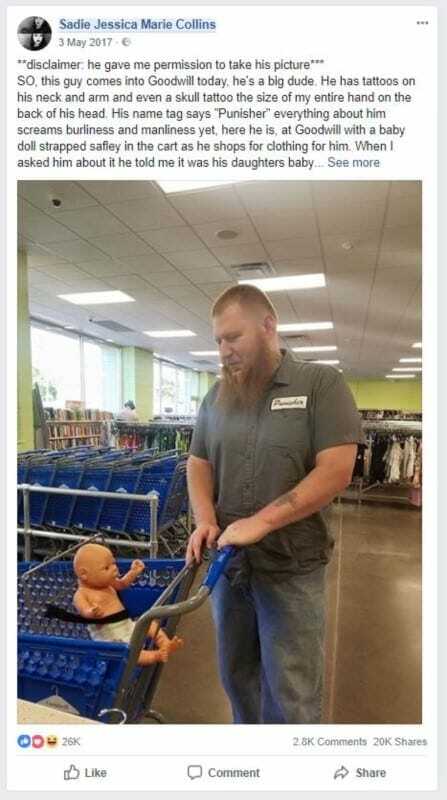 Everything about him screamed of being this big burly dude, but even though that was the case, the little doll he was pushing around meant she wanted to approach him. 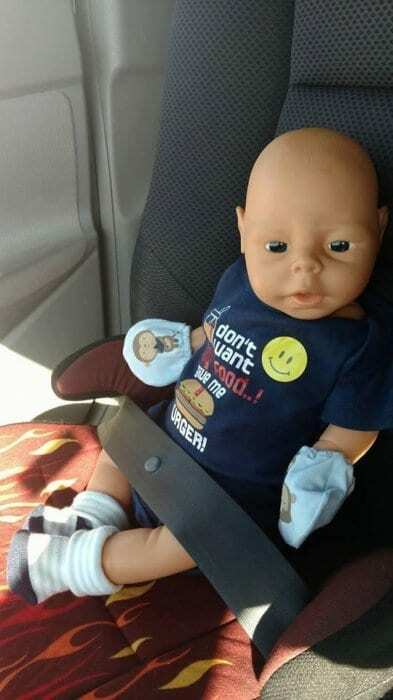 Collins asked him about his doll friend, and he told her that he had traveled with him in his car to get to the store. 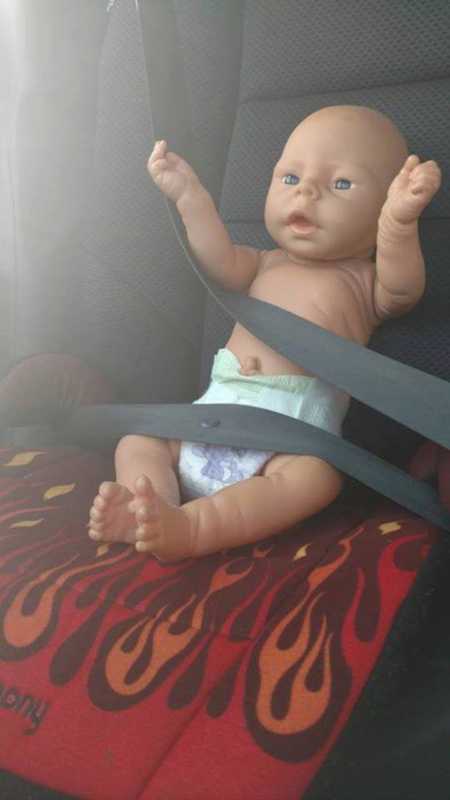 This doll had been treated as though it were a real baby and had pride of place riding up front with Watkins in his car. 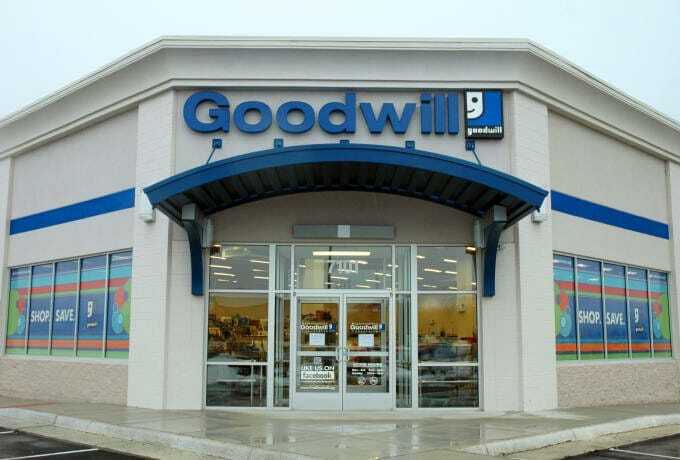 He was strapped into the passenger seat and escorted across town carefully to the Goodwill store. Now they were just two guys about town, shopping for clothes. What is strange about that? Does this onesie bring out my eyes? They came to shop, so it makes sense they found a few outfits for Davey to wear and show off to the world. This doll has style, and Watkins wasn’t afraid to let the world know it. Davey was bought two onesies by his human helper before they took a trip to a Walmart to buy some socks to stop his feet from freezing. They even managed to find little mittens to stop him from scratching people with his fake fingernails. Sadie Collins asked if she could take a few photos of Watkins and Davey. After agreeing that she could, the pair set about posing around the store trying to get a variety of shots in what turned out to be a little bit of a fashion show. 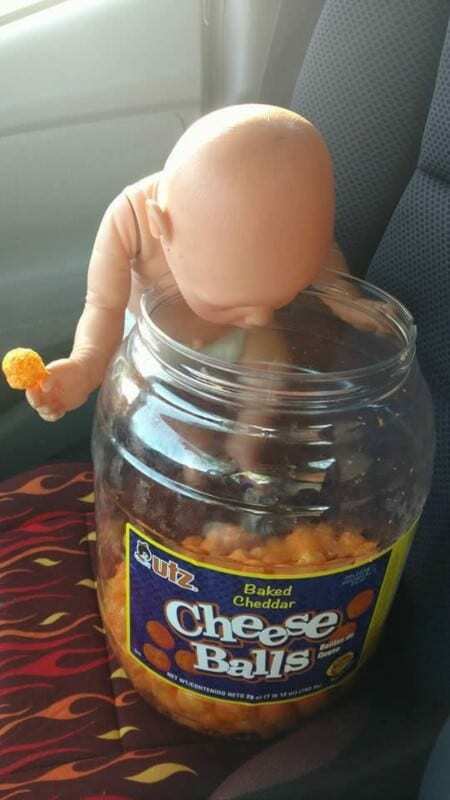 While Davey isn’t the first doll to be dressed up, he might be the first to have been shared across the internet to capture the hearts of thousands of people. Watkins, who appears from the outside to be a big scary man, looks as though he started enjoying being a part of this event. 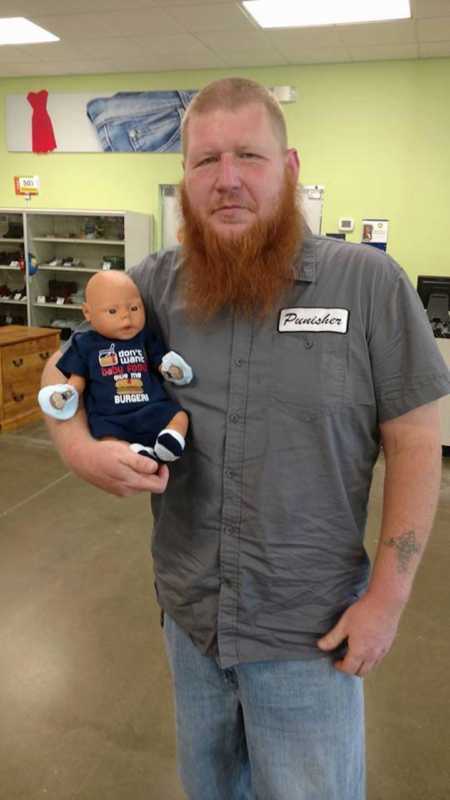 He and Davey posed several times around the store and Watkins looks as though he is smiling while holding the doll with pride. The pictures would later appear online, but Watkins was happy to snap a few of his own too as he wanted his someone special to know that he was doing a good job of taking care of Davey. Collins shared the photos she took of Watkins and Davey to the Facebook page of the good news website, Love What Matters. She wanted people to know how well he had treated this doll and the reason why he was looking after it so carefully. She wanted Watkins to receive some recognition for sucking up his pride to care for this toy. Collins thought if the actions of this man didn’t show true love then she didn’t know what would. 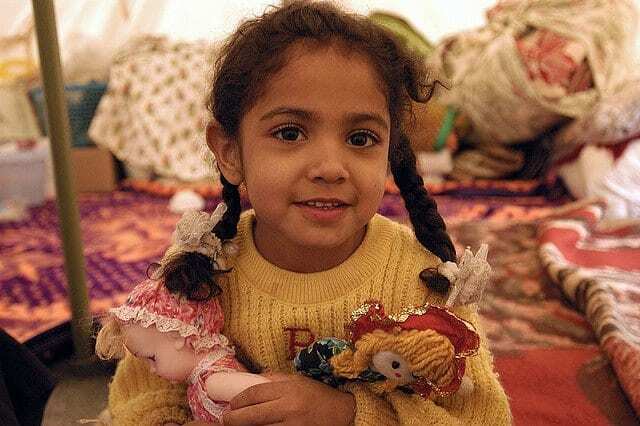 Sadie Collins mentioned in her post that if Watkins could look after this little doll with such care and attention she couldn’t imagine how well he must treat the person who the doll belongs to. She described his actions as amazing, and she hoped that by sharing it with the social media account it would bring as many eyes as possible toward his incredibly selfless actions. This was something unexpected on Watkins’ behalf, and he felt compelled to respond once he knew his story was reaching thousands of people. 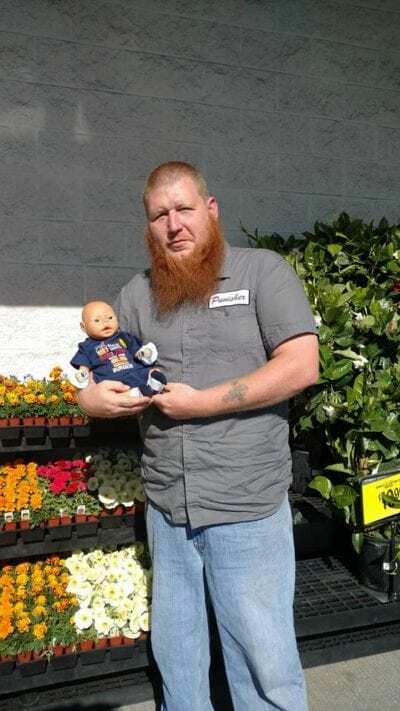 Later that day, Watkins came across the post on Love What Matters’ Facebook page and confirmed that it was indeed him, although he was unaware that the store assistant was going to share his story with the whole world. 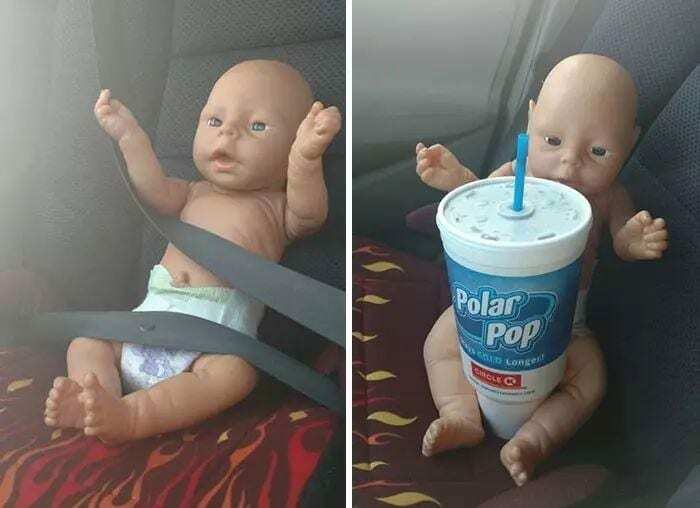 He suggested that what he was doing, he was doing for love, stating that he was a man of his word and had promised someone special that he would take care of this doll for them. He wanted the person to know they could always rely on him. Love What Matters is a website that shares stories of people and families who come through difficult situations with a positive outlook on life after the experience. They shared Keenan Watkins’ story thanks to Sadie Collins sending it to them. They share stories of success and celebrate all of our differences while at the same time celebrating the everyday heroes who often don’t get the praise they deserve. Love What Matters celebrates ordinary people doing extraordinary things, which is why this story resonated with so many people. Although he didn’t become an A-list celebrity or anything, for a time Watkins was finding himself to be the topic of much discussion on the internet. 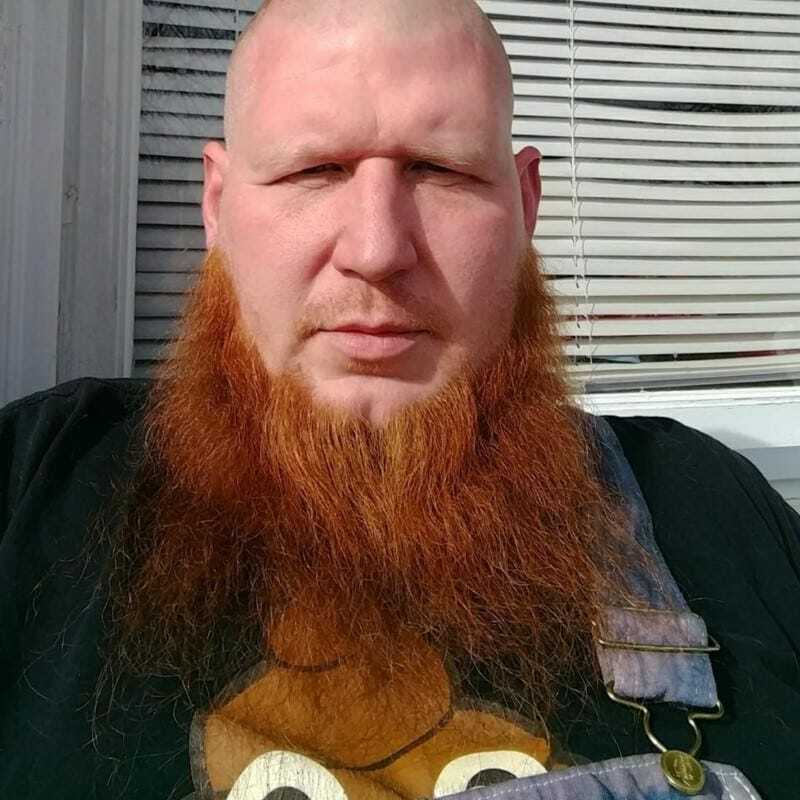 In response to his newfound popularity, he sent a post from his own Facebook page, commenting on the messages he had been receiving. He acknowledged what he did might have been considered a little weird but said his motivation was purely to make someone else happy, nothing more, and nothing less. Watkins admits in a post he later sent to Love What Matters, that he was apprehensive as he entered the store. He didn’t know exactly where he was going and so had to find some help. That’s when Collins stepped in, and the pair got to talking. After explaining the situation, and not being treated as though he was crazy, he agreed to pose for the photos after making friends with the shop assistant. He tried a couple of outfits on Davey before heading to pay for the clothes. When he was paying for the outfits, he almost managed to lose Davey. He was standing in line behind a young girl and her mom, and the girl was looking up at Davey wondering why the big man got to play with him and not her. After exchanging a look with the girl’s mom, he explained what was happening, and Watkins was happy she didn’t make any judgemental remarks. Finally, the shopping trip was complete, and Davey even managed to receive a sticker from the cashier. The story hit many people right in the heart and support came flooding in for Watkins and his adorable tale. As it stands, over 48 thousand people have liked the post hosted by Love What Matters, and it has been shared 10 thousand times. There were also thousands of messages of support from those who read the story with many people claiming what he did wasn’t weird as they would have done exactly the same if it was them. There were messages of support from big burly men who want the world to now that they have feelings too and can be just as sensitive anybody else. Many are happy that he is able to be a ‘real man’ and do things that might feel awkward and embarrassing but didn’t let that stop him from doing what he thought was the right thing to do. The gesture was recognized as a beautiful thing to do, even for a man with “Punisher” on his shirt. 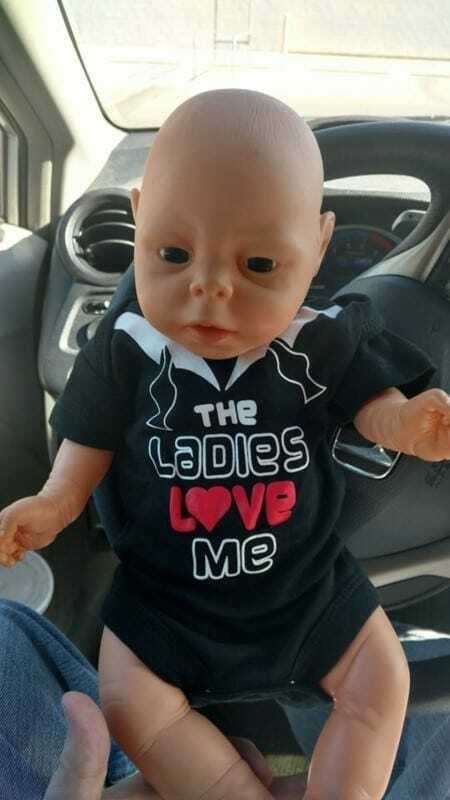 So it turns out that Watkins had been parading this little doll, Davey, around all day because the night before his daughter had asked him to take it with him everywhere he went. She even suggested he could take it shopping as Davey was in need of some clothes and socks. Watkins, being the devoted father that he is, was true to his word. He explained that took Davey everywhere he went that day all because of the love he has for his young daughter after accidentally agreeing while distracted. Watkins admitted that he had agreed to care for Davey after his daughter asked him to while he was cooking. Concentrating on not burning the rice, he absentmindedly agreed to his daughter’s request but only realized he had accepted to do something he might regret after she became noticeably excited. When it dawned on him what he had agreed to do he acknowledged his promise to his daughter making sure he stuck by his words and fulfilled his promise.